Note: We are unable to provide one-on-one supervision, specific medical support, or guarantee an allergen-free environment. 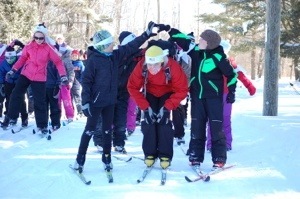 Due to the extreme conditions of cross country skiing, and for the safety of all of the participants, parents are expected to support the volunteer coaches by accompanying their skier at times to promote success. Program Description: Skiers in this age range develop the three important aspects of cross-country skiing: technique, fitness, and speed. The Jackrabbit program is designed for children up to the age of 10 years. All skiers begin at Level 1 and progress through the four levels of the Jackrabbit Program. Children starting to ski for the first time who are older than 7 years of age register in Level 1 and are assessed by their coaches to determine the best level for the skier based on their skiing skills. Classic skis, boots and poles are required to participate. Waxless skis are appropriate for Level 1 however by Levels 2 and 3 the skier is encouraged to progress to wax skis and parents are encouraged to attend waxing clinics to learn how to properly wax their children’s skis. Combination or skate skis are recommended by Level 4 as well as classic skis. Upon graduation from the Jackrabbit program, skiers will have developed skate and classic ski skills and are encouraged to continue skiing with the Racing Rabbit or Track Attack Programs. The Soo Finnish Nordic Ski Club offers a program that follows the guidelines as prescribed by both Cross Country Ski Canada and Cross Country Ski Ontario.